Learn what is the armor of God – protection. A prayer for protection and article on the armor of God. The armor of God provides protection from the strategies and deceitful methods of Satan. We are exhorted twice in the book of Ephesians in the Bible to avail ourselves of the armor of God. “Put on all the armor that God gives you, so that you will be able to stand up against the Devil’s evil tricks. For we are not fighting against human beings but against the wicked spiritual forces in the heavenly world, the rulers, authorities, and cosmic powers of this dark age. So put on God’s armor now! Then when the evil day comes, you will be able to resist the enemy’s attacks; and after fighting to the end, you will still hold your ground” (Ephesians 6:11-14 GNB). Resist means to stand against, as in `antihistamine’. Some drugs are used to minimize the effect of histamine in certain allergic conditions e.g. hay fever, bee stings and drug allergies. 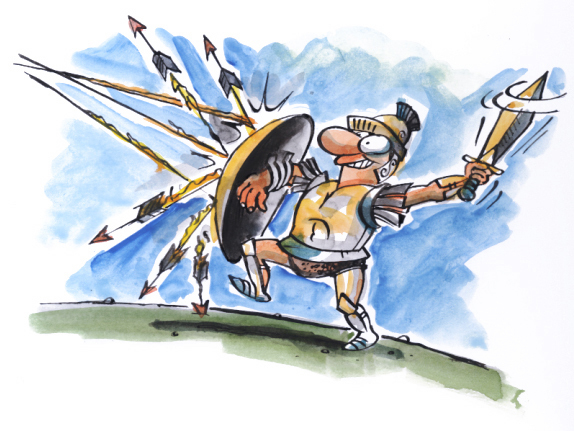 We `put off’ and resist destructive forces cast against us, by equipping ourselves with God’s armor. So stand ready, with truth as a belt tight around your waist, with righteousness as your breastplate, and as your shoes the readiness to announce the Good News of peace. At all times carry faith as a shield; for with it you will be able to put out all the burning arrows shot by the Evil One. And accept salvation as a helmet, and the word of God as the sword which the Spirit gives you. The armor Paul is talking about here in Ephesians 6:14-18 is, in reality, the Lord Jesus Christ and, by placing the armor on, we are expressing our dependence upon Him for His care and protection. The Armor of God – What is it? Truth should cleave to us as a belt cleaves to our body. Jesus, praying to the Father, gives a clear and straightforward definition of truth: God’s Word: His promises, His commands, His word—they are all truth, plain and simple. What does truth have to do with a belt? Peter used an interesting analogy: “Gird up the loins of your mind.” The New International Version translates it as “prepare your minds for action.” Our battle is in the mind to either believe the enemy’s lies or the truth of God’s Word. Put off the works of darkness: the lies of the enemy. Put on the Lord Jesus Christ – the armor of God. Declare: JESUS YOU ARE MY TRUTH. “Riches do not profit in the day of wrath, but righteousness delivers from death.” (Proverbs 11:4) Without righteousness, we leave ourselves open to almost certain death. With righteousness—just as with a breastplate—the otherwise fatal attacks of our enemy are thwarted. Put off the works of darkness – the lies of the enemy. Put on the Lord Jesus Christ – the armor of God . Declare: JESUS YOU ARE MY RIGHTEOUSNESS. Why is the gospel associated with protective armor like shoes? Go means to move from one place to another. You cannot go without preparation – unless you are ready. So let me suggest that the emphasis is on the preparation in having the shoes of the Gospel of Peace. We have been given power for sharing the Gospel of Peace. In Luke 24: 49 the disciples we instructed to remain in Jerusalem until they were clothed with power from on high. And in Acts 1:8, “You shall receive power when the Holy Spirit has come upon you”. According to Acts 5:32, to be filled and clothed with the Holy Spirit requires an obedient heart. “The Holy Spirit is God’s gift to those who obey him.” – The Holy Spirit is given to those who in their going, in their daily activities, share the good news with others. Put off the works of darkness – disobedience and fear – the lies of the enemy that say, “I can’t do that”. Put on the Lord Jesus Christ – the armor of God. Declare: JESUS YOU ARE MY EMPOWERMENT. Paul tells us that the shield is something we must take up, something we are required to raise. Why is a shield associated with faith? The shield defends our whole body. The shield of faith has a very specific function, which the Bible makes abundantly clear: That is to quench all the fiery darts of the wicked. Not some but all of Satan’s flaming arrows of doubt. In Ephesians 2:8, Paul says, “For by grace are ye saved through faith; and that not of yourselves: it is the gift of God:” We have to put faith in God’s grace, but the faith that we use isn’t our own human faith. This verse says that faith is the gift of God. Jesus instructs us in Mark 11, verse 22, to “Have faith in God.” In the original language, this means having the faith of God. Faith is what brings the things God has provided for us from the spiritual realm into the physical realm (Hebrews 11:1). Put off the works of darkness – doubt and unbelief – the lies of the enemy. Put on the Lord Jesus Christ – the armor of God. Declare: JESUS YOU ARE MY FAITH. In Ephesians 6, Paul talks about the “helmet of salvation” as part of the armor of God. Salvation means to save, help in distress, rescue, deliver and set free. Also denotes health, well-being, and healing. What does salvation have to do with a helmet? “We should wear faith and love to protect us, and the hope of salvation should be our helmet.” (1 Thessalonians 5:8 ESV.) We have an enemy and he is real. He wants to control our thought life. Put off the works of darkness – unforgiveness and the lies of the enemy. Put on the Lord Jesus Christ – the armor of God. Declare: JESUS YOU ARE MY SALVATION – MY DELIVERER – MY HEALER – MY WHOLENESS. “For the word of God is living and powerful, and sharper than any two-edged sword, piercing even to the division of soul and spirit, and of joints and marrow, and is a discerner of the thoughts and intents of the heart.” (Hebrews 4:12) The all-powerful sword of the living God – the Word of God – is able to cut through every defense our enemy can raise—down to the very division of bone and marrow. When God’s Word shows us something wrong in ourselves, we can use this spiritual weapon to “surgically” remove the offending thoughts and actions (2 Corinthians 10:4-5). Unlike all other pieces of the armor of God, which are solely defensive, the sword is uniquely suited for both defensive and offensive roles. Notice that Jesus Christ used the Bible to counter Satan’s attacks (Matthew 4:4, 7, 10). There is no enemy the Word of God, coupled with His Spirit, cannot defeat. Having put the armor on – stand firm. Ephesians 6:13 says, “Therefore put on the full armor of God, so that when the day of evil comes, you may be able to stand your ground, and after you have done everything, to stand. Stand firm then…” Equipping ourselves with God’s armor is not a mechanical operation; it is, in itself, an expression of our dependence upon God. This prayer will help you depend on Jesus and in so doing protect you from the devil’s attacks. This is how you put on the armor of God. Thank you, Jesus, that your truth frees me from sin and its consequences. Help me to recognize the deceptions and lies of the evil one so I can replace them with your truth. Thank you, Jesus, that others will see your good and holy nature through all I do and say today. Fill me with your love, joy, peace, patience, kindness, goodness, faithfulness, gentleness and self-control. Thank you, Jesus, for directing my steps as I depend on your power today. Help me to stand firm and share with others how they can know your peace. Thank you, Jesus, for promising to care for me when I trust you. Replace my fears and doubts with your faith as I ask you to help me with the challenges I face today (be specific). Thank you, Jesus, that your salvation is blessing me with your goodness in every area of my life – healing, providing, protecting and delivering me from sin. Thank you, Jesus, for your Word. It is written in the Bible that you triumphed over all the powers of darkness when you died on the cross, and through your blood, I will overcome today.